Oil is a staple in every kitchen. It is used every day for roasting, grilling, baking, frying, sautéing and creating dressings. There are so many different types of oil to choose from for example canola oil, corn oil, peanut oil, sunflower oil, olive oil and coconut oil. But how do you know which one these oils is best for cooking? When choosing your cooking oil there are 3 things to remember: oil composition, smoke point and flavor. 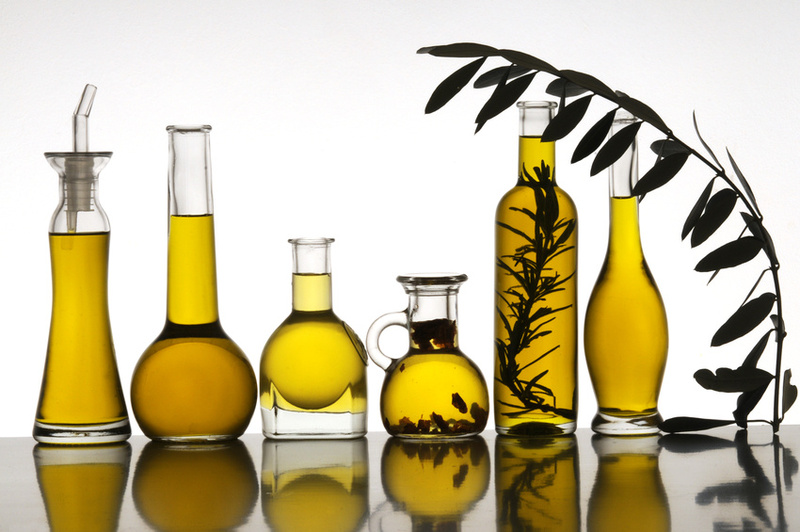 Every oil contains different proportions of saturated, monounsaturated and polyunsaturated fats. Saturated fat is considered to be unhealthy and has been linked to a number of diseases such as cardiovascular disease and cancer. On the other hand monounsaturated and polyunsaturated fats are considered to be healthy fats. Monounsaturated fats have been associated with lower ‘bad’ LDL cholesterol, increase in ‘good’ HDL cholesterol and better blood sugar control. Polyunsaturated fats have been linked to a lower risk of heart attacks and breast cancer and have been positively associated with cognitive and behavioral performance. So it is only be natural to assume that oils which are low in saturated fat are the healthiest. This is indeed true for oils which are used without being heated for example when used in salad dressings. But these healthy oils become unhealthy when heated. The problem with high proportion of monounsaturated and polyunsaturated fats in oils is that when heated they oxidize very quickly. Polyunsaturated fats are particularly unstable. The process of oxidization makes the oils rancid. Rancid oils when consumed have a number of adverse health effects. The harmful free radicals and other substances created during oxidization can, over long time, cause cellular damage, diabetes, Alzheimer’s, damage to DNA, accelerate ageing and create an environment for cancer development. So the healthiest oils for cooking are those which are high in saturated fat for example extra virgin coconut oil. Smoke point of an oil is a point at which the nutritional value and flavor begin to decrease. It is also a point at which the oil begins to change chemically and starts to create free radicals and other cancer causing compounds. Every oil has a different smoke point. When choosing an oil for cooking it is good to opt for one with higher smoke point. Oils also differ in their flavor. For example olive oil tastes very different to coconut oil which in turn tastes very different to butter. When choosing your oil for cooking it is important to consider whether you want an oil which is very neutral or whether you are trying to infuse extra flavor to your dish through the oil you are using. So what is the best oil for cooking? The best and the safest oil to cook with is extra virgin coconut oil. This is because it consists almost entirely of saturated fats and these fats do not oxidize when heated. If you are not keen on the taste of coconut oil, I would choose butter or palm oil in the second place. Hemp oil, safflower oil, grape seed oil and flaxseed oil are the unhealthiest for cooking due to their high polyunsaturated content. Tags: Coconut oil, Cooking oil, Low-density lipoprotein, Monounsaturated fat, Olive oil, Polyunsaturated fat, Saturated fat, Smoke point | Permalink. 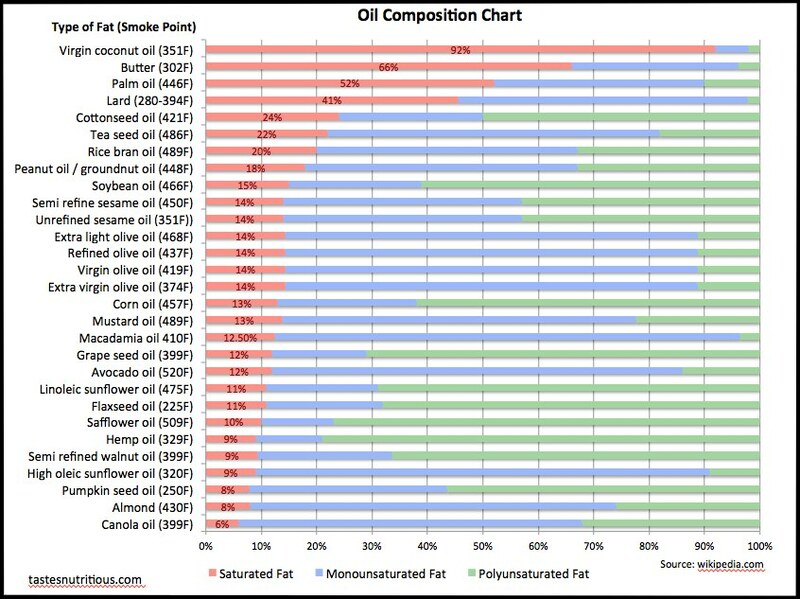 Rapeseed oil is the same as canola oil right at the bottom of the chart.